Steve Rogers (Chris Evans) is still trying to adjust to his new life. He doesn’t quite fit in living in his new life. He has a lot to catch up on. But he is still a soldier. He always will be. S.H.I.E.L.D. is working on a new initiative to preemptively handle threats to world safety. Nick Fury (Samuel L. Jackson) is working with Alexander Pierce (Robert Redford) to get approval from the World Security Council to launch their counter-terrorism system. A new enemy, the Winter Soldier (Sebastian Stan) shows up in Washington, DC. After an attack, Steve learns that not everything is as it seems. All that Steve knows and trusts is thrown into question. Is there anyone he can trust? Captain America teams up with Natasha Romanoff (Scarlett Johansson), aka, Black Widow, and a new ally, PTSD counselor Sam Wilson (Anthony Mackie), aka Falcon. The trio tries to find out who was behind the attacks and where the real threat is, while Steve is dealing with a blast from his past. I won’t go any further into the plot. It would be too easy to give things away. Nobody wants that. The Captain really finds his stride in this sophomore film. He hits the ground running full speed. There are many subtleties that you may not catch, if you haven’t read the comic books. Luckily, the friend I took with me is a comic book junkie and explained them to me. There are a lot of moving pieces in this film. You have to keep track of who’s who. You have to remember characters and plots points from the original Captain America. This isn’t one of those franchises you can jump into in the middle and not be completely lost. If you don’t see the first one, you will have no idea what is going on. Aside from it being a good film, this is another reason to give yourself a refresher. There is excellent chemistry between the 3 major players. This is probably the best performance by ScarJo in all the Avengers saga. She has been more of an ancillary figure in most of the films, not really having much of a presence. That isn’t the case in The Winter Soldier. She is front and center, and certainly earns her keep. I’ve heard rumors of Black Widow getting her own spinoff. I was skeptical before, but I can buy into it after seeing her in action in this movie. They definitely leave an opening for that. Falcon and Captain America play well off each other. It’s not quite Tony Stark and Bruce Banner in The Avengers, but it works. Besides, that sarcastic back and forth is not the tone Captain America is going for. That’s RDJ’s realm. This series has a darker feel. This is what I like about the Avengers saga. Each branch has its own unique feel. But when you put them all together, they mix well. I would not have expected to see Robert Redford in a superhero movie. Nor would I have expected him to do well. But he plays his part like a true veteran. Cobie Smulders and Samuel L. Jackson are up to par with their performances in the other films, but they are just support characters. They move the plot along enough, but they’re not the focus. I would have to say this film is better than the first. The advantage of Winter Soldier is that all the back story is told in The First Avenger. It lets Winter Soldier get right to the action. Which it does. And there is plenty of it. And it is spectacular. Not only that, the story and writing is near flawless. The screening wasn’t in 3D. And it didn’t need to be. The film is good enough to carry itself without the added dimension. Make sure you stick around for the credits. As with all Marvel movies, there is a mid-credits scene, which teases Avengers: Age of Ultron. I won’t spoil it for you, like I have seen done elsewhere. There is also an end credit scene, which hints at where the next Captain America might take us. And if you’ve read the comics, you can see where it is headed. 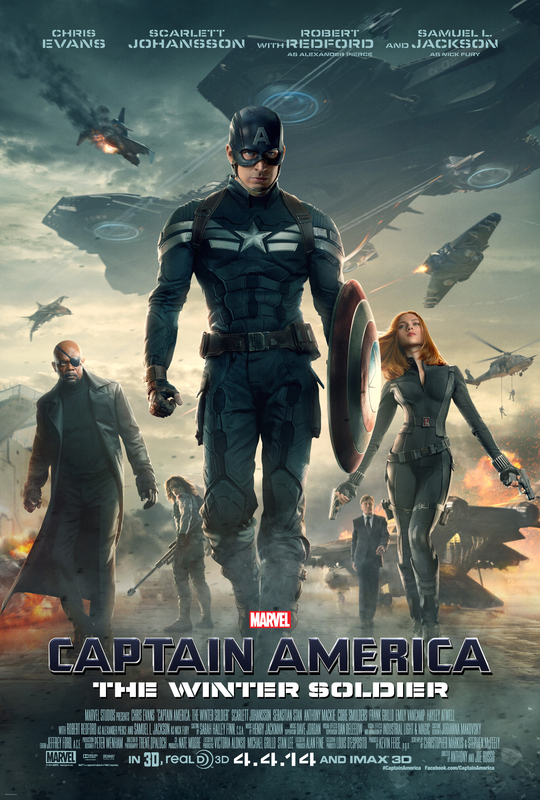 If you like what Marvel has done recently, you won’t want to miss Captain America: The Winter Soldier. It really is one of the best films of the Avengers saga.